with TrueBlock™ Technology for Laser and Inkjet Printers, ⅔" x 3-7/16"
A colourful solution for the office to keep file folders neat and professional. Easily organize and quickly identify important file folders with Avery® Filing Labels with TrueBlock™. You'll be able to confidently reuse folders with old markings and labels. Avery's patented TrueBlock™ Technology labels guarantee to completely block everything underneath. A colourful solution for the office to keep file folders neat and professional. Easily organize and quickly identify important file folders with Avery® Filing Labels with TrueBlock™. You'll be able to confidently reuse folders with old markings and labels. Avery's patented TrueBlock™ Technology labels guarantee to completely block everything underneath. Write by hand or create and print customized labels with your inkjet or laser printer using free templates from Avery® Design and Print Online software. The permanent adhesive ensure labels will stay put and will make your folders look great. Labels that are practical, easy and fast - now you've got it all covered. 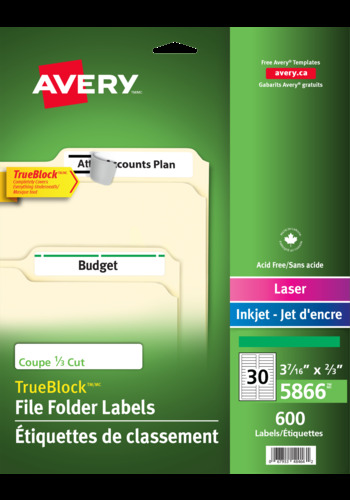 Label Size ⅔" x 3-7/16"
Avery's patented TrueBlock Technology completely covers everything to eliminate any confusing marks showing through file folders.